I am thinking this must be the mindset of an arsonist. I wonder if an arsonist ever thinks about the lasting effects their actions have on those who inhabited a building they set on fire. Unfortunately, I was in a building that was set on fire—not once, but three times while my mom and I were living there. This happened in a northeast suburb of Chicago, as I was going to nursing school. The building was U shaped, with a courtyard in the middle. The neighborhood wasn’t in the best area, but I didn’t think it was the worst, either. I had never been robbed or attacked or anything, so I guess I felt safe…at least until the fires hit. The first fire started in the back alley of one of the U wings and spread to the building. Though it was scary, it wasn’t close enough to cause me too much alarm. I remember helping the people whose apartment got the brunt of the damage move to another vacant apartment in the building. I figured it was the least I could do. And I likely thought it was a random event. Out of the Frying Pan…Into the Shower? When the second fire hit, I was in the shower. I remember hearing a lot of noise outside the bathroom window, but didn’t think much of it at the time. That is, until the water became scalding hot- hotter than I had ever felt, even when I had turned it up to its hottest. I turned the faucet to cold. Unfortunately, that didn’t work either—it was still scalding hot, so I turned it off completely. Then I heard the yelling outside intensify, and raised the window enough to hear them yelling, “Fire! Get out!”. I don’t think I ever dressed so fast in my life, grabbing my purse, and then my mom and I got out. This fire was on the back stairwell that butted up to the bedroom. Luckily, this was protected by a firewall, so no damage was done to our apartment, but it was still much too close for comfort. I believe it was this fire that caused me no longer to feel safe. To make matters worse, a third fire hit. This time, it was in the laundry/storage area underneath our apartment. This one happened at night, when my mom and I were asleep. We were on our way out of the apartment just as the smoke was getting too thick to inhale. My mom started coughing hard. I was less affected, maybe because I was younger, maybe because I didn’t smoke and my mom did, or maybe I was holding my breath better. Our apartment was an elevated first floor, with the mailboxes in the lobby below and two sets of doors. We made it down to the first door, but mom was coughing even harder. Finding our way in the dark wasn’t all that easy either. But, I remember finding the doors, and I had to practically shove my mom out the front door to get her out of the smoke. We made it. We were informed when the fire was out that we could go back into the apartment. It was safe. Safe? How does one feel safe when they barely got out in time? How does one feel safe with no back door at night? The firemen had demolished the door to get in and check everything out. My mom and I decided I would sleep on the couch in the living room that night until the door could get boarded up the next day. I remember it was difficult to get to sleep. I must have eventually, though, only to awaken to a noise in the middle of the night. There was no electricity, so I couldn’t tell what time it was, but it was still very dark out. When I opened my eyes, I saw the figure of a person standing in the apartment. My first thought was it was my mom, but then I realized with horror it wasn’t. I don’t remember for sure what I said, but I remember getting up and yelling at the person to get out. It worked. When my mom finally found a flashlight, we found a number of our belongings piled up on the back porch, which had survived the fire. Apparently, this person was stockpiling some of our “goods” since he or she had easy access to the apartment now. This was insult added to injury, being robbed when at our most vulnerable. There was no sleeping after that. The next morning when we finally had decent light, we took stock of our apartment, our belongings, and the reality of dealing with the aftermath. Though our clothes were intact, they reeked of smoke. The furniture reeked of smoke, and of course the laundry area was not safe to go in to do wash. Plus, we did not want to leave the apartment unattended until the back door was boarded up or replaced. Eventually, it did get fixed, and life went on, but not without after-effects. Graduation from my nursing program was not far off, and I moved out of the neighborhood into my own apartment. I tried to get mom to come with me, but she didn’t. She stayed at that other building for maybe another four to six months before she found another apartment about a block away from mine. Luckily, there were no more fires. For close to a year, I would wake up in the middle of the night thinking I smelled smoke. Every time I heard a siren in the middle of the night, I would sit bolt upright in bed, or jump out and check the apartment and windows until I was certain there wasn’t a fire truck in the front yard. I would wake up with palpitations sometimes. This fear, this feeling of dread, was something I thought I would never overcome. But eventually I did. I am still extremely afraid of fires, and sirens in the middle of the night still cause me concern, but I don’t think I panic quite as much. While a healthy respect for fire is good, I think I carry an abnormal fear—more than most people. 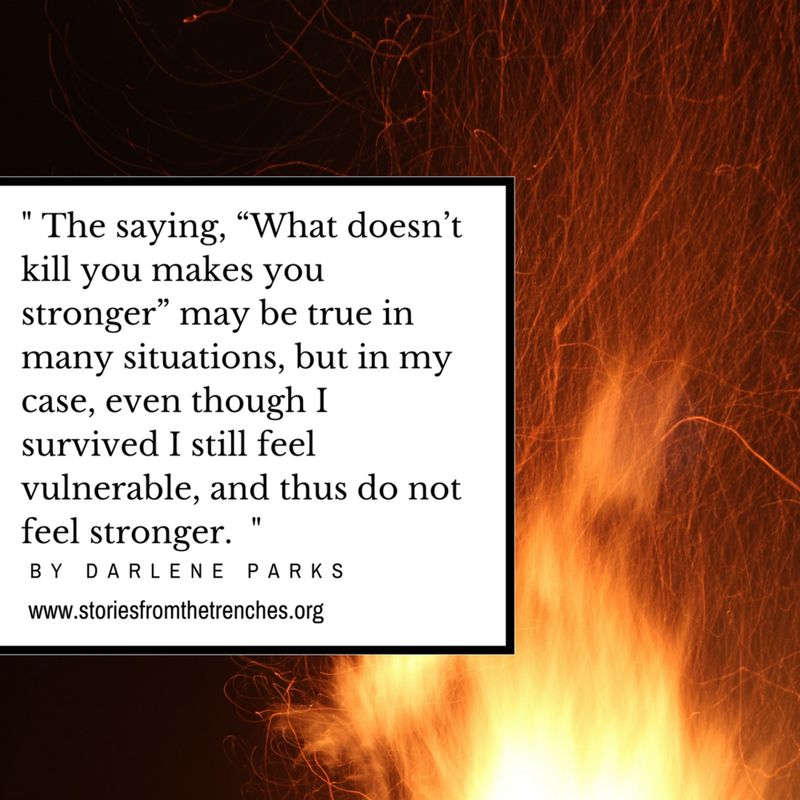 The saying, “What doesn’t kill you makes you stronger” may be true in many situations, but in my case, even though I survived I still feel vulnerable, and thus do not feel stronger. I don’t know if they ever caught the arsonist. I don’t know that he or she will ever know how badly it affected me and maybe the other tenants. Would they care even if they did know? I do know that I am very grateful to be alive and healthy, and to have survived both physically and mentally, though it wasn’t easy. I do know that I am luckier than others who may have been in fires. I can only hope that if others survived physically, hopefully they survived mentally as well.